I first started writing RobZerrvations when I was in high school, oh so long ago. I was in the Journalism class, writing for the newspaper, the Hazen Highlife. I never liked real reporting much, so writing a weekly column fit the bill perfectly for me – an easy way to get an ‘A’. I continued to write RobZerrvations in college at Green River Community College. I was sequestered with the two comic artists, far away from the rest of the staff. I think Ed Eaton thought we’d be less mischievous if we didn’t have an audience. He was so wrong. I didn’t really give the idea much thought again until I moved to the tiny community of Port Orchard where I started a local community site, portorchard.com. It was there that I started writing about things that came to my mind, most humorous, some very pointed and downright smarmy. Fast forward to Florida. Facebook came along and once again I started RobZerrvations. And rather than fill its pages, I opted to go out on my own and finally start an official site, dedicated to my lifetime of observations that are unique to me, i.e., RobZerrvations. As for those who don’t know me, suffice it to say that I am a noted expert on the communications process, a successful author, mediocre musician, talented entertainer, tortured novelist, dedicated father of two, fervent community activist, horrible gardener, occasional world traveler and bon vivant. 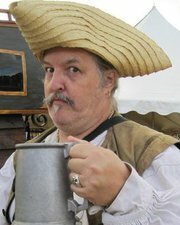 In real life I am a Story Laureate and Captain of The Pyrates of the Coast. After eight years on the lam in Florida living the life of a beach bum, I have returned to the Pacific Northwest, the homeland.